I was just checking my e-mail and came across this article. "...The iconic recipe is now protected by an array of high-tech security gadgets, including motion detectors and cameras that allow guards to monitor the vault around the clock. Thick concrete blocks encapsulate the vault, situated near office cubicles, that is connected to a backup generator to keep the security system operating in times of power outages..."
I automatically thought to myself (and if you are a fan of Fox's Prison Break, I'm sure you did too)...aahhh, so "The Company" is Yum Brands, Inc. It was announced recently that Prison Break would be canceled after the current season - basically because there's no story left to be told. They broke out of prison, they managed to escape capture from when they escaped from prison, they escaped from a South American prison, and they are currently infultrating and bringing down The Company...which ironically included breaking into the world's most intricate and heavily guarded safe. Now I'm wondering, did this story actually become NEWS to preempt that Prison Break WILL be returning for one more season? 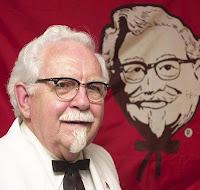 To steal Colonel Sanders secret recipe? If anyone can do it, Michael Scofield can. If I've learned anything in the past few years, I've learned that Michael Scofield and Jack Bauer are unstoppable and that I will definately miss my Mondy night eye candy. 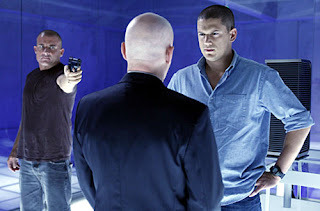 Michael Scofield and Lincoln Scofield are 2 of my 5 "passes." (wink, wink...and no, not the actors - just the tv characters themselves). Lol, that I just had to increase that from 3 passes to 5 as I remembered my Friday Night Lights eye candy, the third being Entourage's Vinnie Chase, of course. The TV I watch is so embarrassing that I can't even admit to it. I was just about to write the name of a show I watch here....then I decided against it. LOL You are too funny Julie! Laura - LOL - I probably watch it. I watch almost everything and I LOVE high school dramas.